Carroll, J.B. & Eifler, K.E. (2002). Servant, Master, Double-Edged Sword: Metaphors Teachers Use to Discuss Technology. 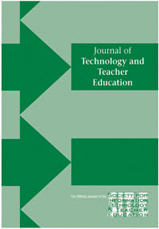 Journal of Technology and Teacher Education, 10 (2), 235-246. Norfolk, VA: Society for Information Technology & Teacher Education. Retrieved April 22, 2019 from https://www.learntechlib.org/primary/p/8924/.